Macaroni cheese is a tasty pasta dish that can be prepared easily and served to a hungry family without breaking the bank. There are many combinations of this pasta dish to suit all palates and pockets. The pasta that is traditionally used for the macaroni cheese recipe is thick and tubular and is called macaroni. Many of us will recall this from childhood puddings where the macaroni was cooked with milk and sugar to make a sweet desert but these days it is more likely to be used for a savoury recipe. If you are cooking for children and they have their own favourite pasta shapes there is nothing to stop you using another pasta shape for this recipe. In fact the traditional macaroni pasta can now be purchased in organic and also whole wheat forms making it healthier and modern! A strong cheese will work well with this recipe as you need the cheese flavour to be noticeable when served. Cheddar is always the first thought but if you are using a less flavoursome cheese from your fridge add a pinch of dried or half a teaspoon of mixed mustard to the dish to add a bite to the meal. When grating the cheese try to use the more course side of the grater so that the topping to the macaroni cheese has recognisable pieces of cheese when it is presented. 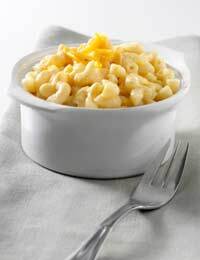 Straight away the thought of eating macaroni cheese will bring gasps of shock to those who are watching their weight. By replacing the cheese with a low fat variety and also using skimmed milk instead of full fat you can cut back on the calories. Also by serving the macaroni cheese with vegetables or a salad there will be slightly less on the plate and therefore less fat in your stomach! Add the macaroni to a large pan of salted boiling water and cook until the pasta is just soft and edible. Drain the water from the pasta. Meanwhile, melt the butter in a deep pan and gradually blend in the flour until you have a thick paste. At this point do not over heat as the mix will cook and not form part of the sauce as needed. Gradually pour in the milk and stir so that lumps do not form. Once all the milk is in the pan let it simmer slowly until the mix thickens significantly. At this point add three quarters of the cheese, take off the heat and mix thoroughly. Add the drained, cooked pasta to the cheese sauce and stir carefully without breaking the pasta. Place into a heatproof dish and cover with the rest of the cheese. Place under the grill and heat until the cheese is a bubbling golden brown and serve immediately. You can mix coarse breadcrumbs with the cheese for the topping along with a pinch of black pepper for a crunchier topping. Slices of tomato also make the top more colourful and tasty. Try hard boiling several eggs and quarter them. Lay them in the heat proof dish before adding the macaroni cheese. This makes an interesting variation to the meal. Thought this was going to be difficult getting the "roux" and milk to form a sauce, but it worked perfectly, then loads of cheese, and more cheese on top, with breadcrumbs also. Brilliant, now I can make it, I know what dinners will be at least twice a week! !